Keep your darts organized and ready for play with the Casemaster Salvo Dart Case. 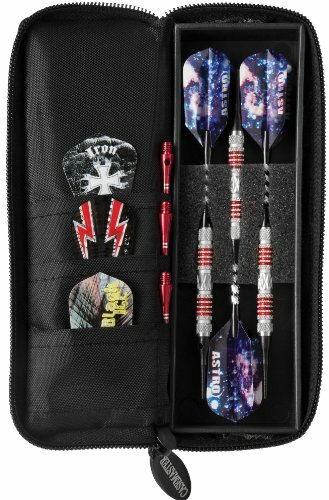 This highly-portable case holds your dart set securely and ready to play in a cushioned foam insert with slits for each dart. Pockets on the other side of the case keep extra flights ready and accessible. The three-sided zipper opening allows you to open the case like a book for full access to your equipment. Constructed with a durable nylon exterior, the Salvo Case keeps your darts protected from moisture. A convenient clip on the case allows you to secure it to your waistband, a pocket, or on a bag.